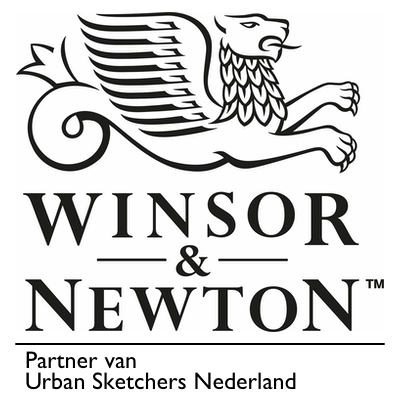 Last thursday the Liège Urban Sketchers book was launched, by a well organized press conference. the book was an initiative by Gèrard Michel and the “Emulation” (they organize cultural and architectural events in Liège). The book recounts the drawings of our group of 13 sketchers, that we made last year in september. We did 4 days of sketching on a 5 meter long strip of paper each. Imagine: 65 meters of sketches! And the book is fantastic! With drawings of Florian Afflerbach, Simo Capecchi, Fabien Denoël, Rolf Schroeter, Miguel Herranz, Lapin Barcelona, David Emdé Magli, Antoine Michel, Gérard Michel, Corinne Raes, Luis Ruiz Padrón and Inma Serrano. And myself, Rene Fijten. I went to the presentation of the USK Liège book last thursday. Some of the sketchers that feature in the book were also there: Florian, Gèrard, Lapin, Antoine and Fabien. So we took the opportunity to go out and sketch. On friday Gèrard had the bright idea to go to a rooftop of an apartment building overlooking the Meuse/Maas. Mind you: the temperature was barely above freezing point, and there was a chilly wind. Only if you stood in the shade of one of the chimneys, the feeble sun would warm you up a little. The sketch is the view over the city centre.